Maca root is a legendary Peruvian staple food prized for its superior nutritional value and for its positive effects on mood, energy, fertility and libido-according to both modern in vitvo clinical trials and routine maca eaters across The Americas. Introduced to the world food stage in the late 1980s, maca's centuries-old journey of nutritional, cultural, and socio-economic importance in Peru has been revived by scientific nutritional analysis and favourable findings. Enough research to help maca shed its 'fringe food' image and take its rightful place as a super food of the world. In Peruvian cuisine, it's common for maca root to be prepared and eaten like a potato; but here in Canada, we enjoy maca in a gently dried, finely milled powder form; expertly prepared for safe consumption and maximum nutritional value. To avoid eating a poor quality maca that might also make you sick, it's important to always know your maca brand well for maximum food safety, after-prep nutritional content, and nutrient bio-availability since not all maca powders are created equal. All Earth Notions organic maca root powders are equally outstanding in quality carbs, protein, fibre, lipids; are naturally rich in vitamins, minerals, essential amino acids, free fatty acids, and several other essential nutrients. And, they've been expertly prepared (gelatinized) so that they're safe to eat without compromising the whole food nutrition you're after....more information on maca nutrition can be found here. Yellow/gold: for its libido-enhancing effects among men and women, and support of all stages of female fertility. Black/purple: for its significant levels of iodine, and promotion of prolonged physical and mental effort. Red: for its significant levels of iodine, superior levels of antioxidants, and support of prostate health. that the bio-availability of nutrients is 99.6%-one of the highest around, and is why you'll see "raw" on our packaging. Maca root must always be prepared and never consumed truly raw. Maca root powders are no exception. 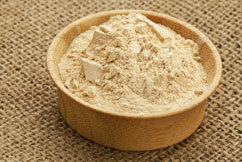 Earth Notions maca powders offer you premium quality, whole food nutrition. They are filler-free. Preservative-free. Non-irradiated. Naturally gluten-free. Certified organic. Our name on the package is your assurance of the highest quality, we guarantee it.